CSU party chief and national Interior Minister Horst Seehofer conceded "it was not a nice day for us"
Munich (Germany) (AFP) - German Chancellor Angela Merkel's arch-conservative CSU allies suffered historic losses in Bavaria state elections Sunday, dealing a blow to her fragile three-party coalition government. The Christian Social Union (CSU) scored 35 percent, a humiliating 12-point drop from four years ago in the wealthy Alpine state it has ruled almost single-handedly since the 1960s. The poor result means it loses its absolute majority and must scramble for coalition allies -- either the conservative Free Voters (11 percent) or long-time ideological foes the Greens, who were the big winners with a record 18-19 percent support. 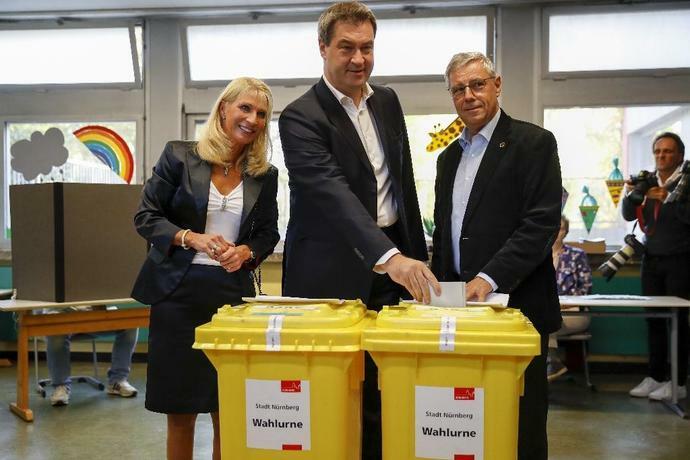 Merkel's other national governing partner, the over 150-year-old Social Democrats (SPD), halved their ballot box support to just below 10 percent, ceding the position of Bavaria's second biggest political force to the Greens. 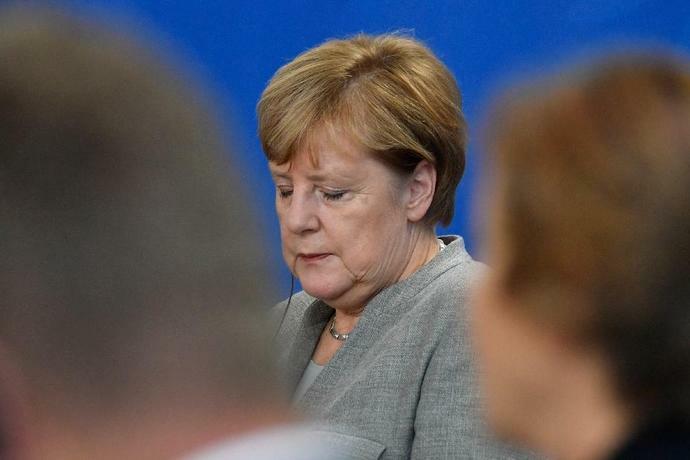 For Merkel, in power for 13 years, the Bavaria election spells a new headache just over half a year since she managed to forge a fragile "grand coalition" with the CSU and the reluctant SPD. SPD leader Andrea Nahles conceded a "bad result for the SPD ... and for all mainstream parties" that she said was partially due to "the bad performance of the grand coalition in Berlin". The AfD's Alice Weidel, meanwhile, jubilantly declared that Merkel's government "is not a grand coalition but a mini coalition" and demanded she "clear the way for new elections". It reflects shifting voter preferences at the expense of mainstream parties in a state which mixes rural Catholic conservative areas with cosmopolitan urban centres home to global companies like Siemens and BMW. 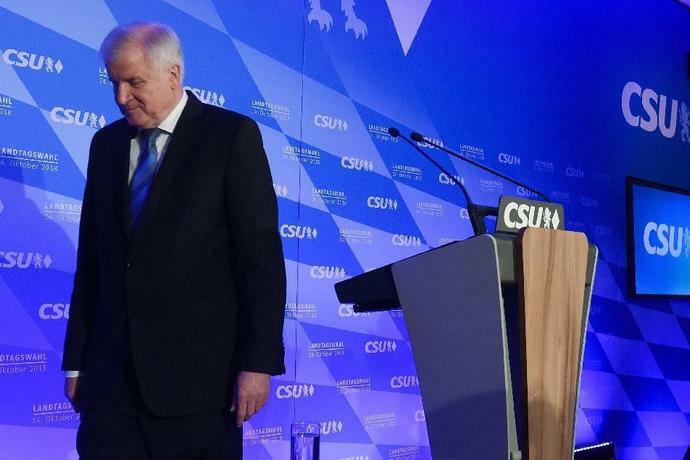 Since Germany's mass migrant influx of 2015, the CSU has hardened its folksy brand of beerhall politics with an increasingly aggressive anti-immigration and law and order rhetoric. The poll result Sunday showed that the tactic and Seehofer's brinkmanship in Berlin have backfired badly. Those Bavarian voters most worried about immigration and cultural identity chose the AfD, while those turned off by the harsh new tone drifted to the Greens. 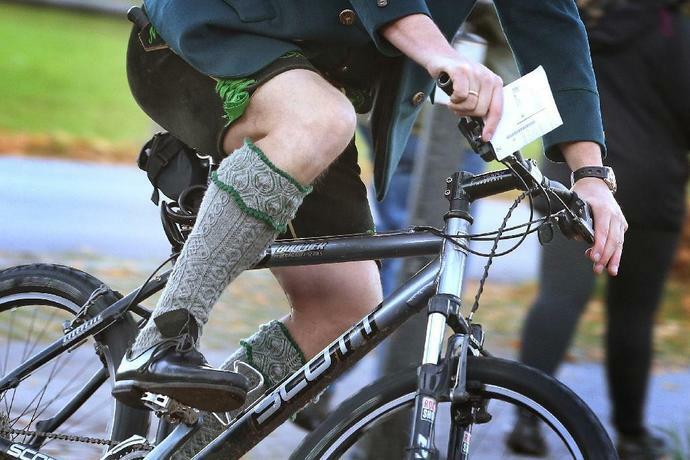 A poll by public broadcaster ARD showed that most voters blame Berlin-based politicians for the CSU's poor performance in Bavaria. While 56 percent saw Seehofer as the chief culprit, 24 percent pointed to Merkel, followed by Soeder at 8 percent. The Bavaria election served as a painful bellwether of the national mood at a time when political commentators speak of the dawn of the Merkel era. Greece suffered hugely under Nazi German rule and a parliamentary commission in 2016 put the cost at more than 300 billion euros, though Wednesday's proposal - backed by both ruling coalition and opposition lawmakers - mentioned no figure. The vote, the first official decision by parliament on the emotive reparations issue, is likely to further strain ties with Germany, blamed by many Greeks for painful austerity measures imposed in return for bailout loans during its financial crisis. "To build a better future we need to close the open cases of the past and Germany needs to do the same," he said, adding that Athens would raise the issue diplomatically with Berlin. Greek lawmakers on Wednesday voted through a resolution demanding the payment of German war crime reparations, an issue long disputed by Berlin. A parliamentary committee last year determined that Germany owes Greece at least 270 billion euros ($305 billion) for World War I damages and looting, atrocities and a forced loan during the Nazi occupation in World War II.